Suncast Tremont’s 8 x 10 plastic shed showcases fashionable style, provides roomy internals and escapes relentless maintenance. Reassuringly, a light pressure wash supersedes wood preserving. For our concerns, breaking free from the frustrations of continuous upkeep was essential. Switching our rot crumbling wooden hut for the resin style escaped the battles of conserving. This weatherproof manufacture circumvents the inconvenience of decay, re-coats of varnish and all associated tasks involved in maintaining decay. If your thoughts are to walk down the same avenue we strolled whilst 8 x 10 feet dimensions wrapped in stylish rot-resistant resin headline your bucket list, inspect Suncast’s make-up & features, they provide an impressive set of advantages. Tremont’s modish presentation enhances any garden with delectable style, exhibiting a neutral vanilla fascia, stony doors and classic slate effect roof. This innovative manufacture is weatherproofed with the durability of UV protected resin. 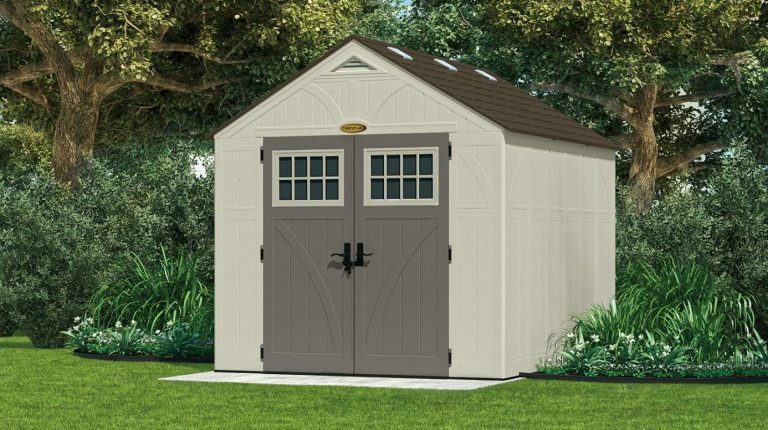 Five sheds complete the Tremont family; they all comprise identical frontage dimensions and incorporate the same doors & features. 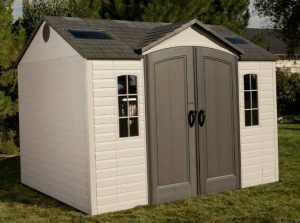 Storehouses expand throughout the group in 3 feet extension kits from the smallest 4 footer up to the largest 16 ft shed. This featured Tremont lies in the centre of the range, the size below regards 8 x 7 feet dimensions whereas the baby of the family spans 8 x 4 feet, presenting a narrow depth ideally suited for confined areas. Moving up the range lies the spacious 13 ft model whilst concluding the group presents the vastness of the Big Daddy, extending sixteen feet in length. Shed Sizes explores Tremont’s competing weatherproof storehouses. After dismantling our dilapidated wooden hut, we embarked on the modern approach for garden storage. Wishing to relegate upkeep duties to yesterday, our theories concentrated on finding a substantial build to stand up to the pressures of adverse weather, one that looks presentable, unsusceptible to decay and minimalist to clean – Tremont’s objective. Blow-molding recyclable polypropylene into multi-layered panels is Suncast’s benchmark whereby the inner skin comprises a sequence of ridges for the purpose of providing substantial dent-free bracing to the external side. The fascia panels interlink with each other simultaneous to interlocking with the base and abutting underneath the roof structure to fulfil their weatherproof design. Alongside the advantages of rot-resistant polypropylene, the entire manufacture is UV stabilised to subsist the afflictions of sunburn causing fractures and colour-bleaching, resulting in a make-up immune from weather-deterioration even when subject to continuous damp settings. Appearance-wise, the fascia exhibits the distinct look of wood, simulated into an aesthetically pleasing panelled display embossed with grain characteristics. Vanilla walls with stony doors compliments garden landscapes with neutral tones. Albeit new appearances looks pristine, it can easily be kept that way, simply by washing it down. Suncast cater to chuck away those old rusty wood-stain tins, it’s not designed for nurturing with varnish nor painting; moreover, it resists peeling. A stand-back pressure-wash regards the majority’s preferred cleaning operation whereas a hose-pipe shower is ours however if you’re surrounded by trees & shrubs you may find deep-seated moss embeds within the grain. Shifting requires a bit of elbow grease, using a supple brush and a splash of detergent or white vinegar. An Apex design is the most commonly sought after roof structure. Tremont’s steep inclining pitch assures rapid drainage when the clouds open meanwhile reciprocate 8 feet of lofty ceiling height inside, providing a comfortable unrestricted walkway through. Suncast’s roof advantage relates to the way it protrudes beyond the fascia’s edge. Couple the steep angle with the overlap, there’s no puddles of rainwater forming, stagnating and finding a way inside due to the walls abutting underneath the roof structure. This impermeable polypropylene manufacture is molded into a double walled composition, shaded & simulated to represent slate roof tiling. 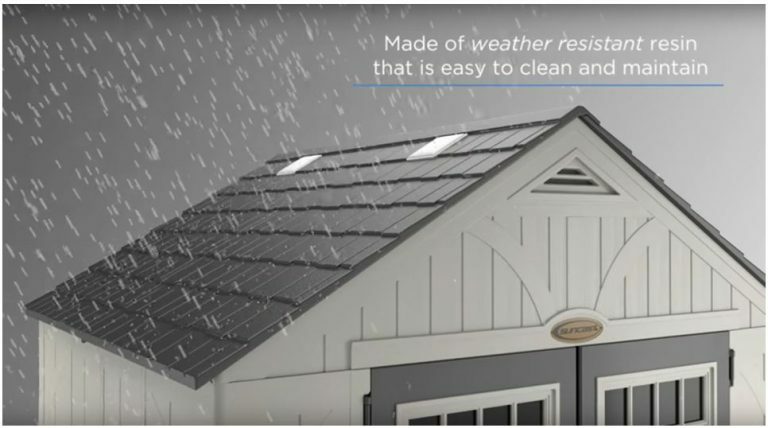 Tremont’s multiple layered roof panels combine robustness with durability to endure continuing weather stresses without being susceptible to decomposing nor replacing; crowning Tremont’s off with a protective structure, the antitheses of roofing felt. 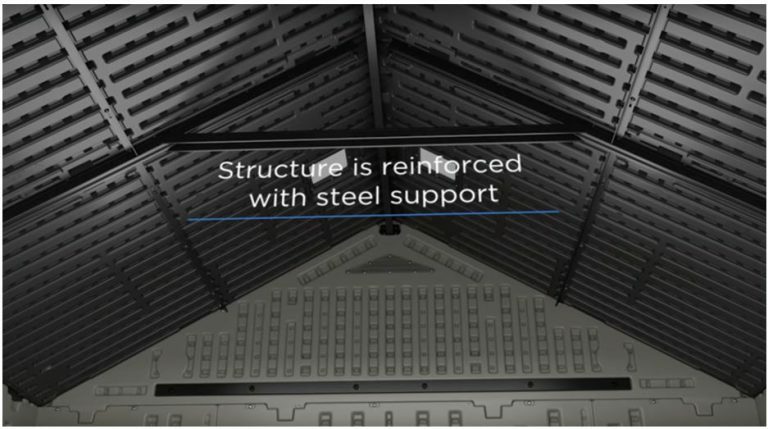 The recyclable roof sheets fasten to the metal framework which is further shored up by two sets of A-frame beams stretching across the internal width, fortifying the top. Initially a built-in floor is what captured our attention towards resin constructions. In contrast, it’s uncommon to find this feature in the metal variety, requiring to fit your own wooden base. 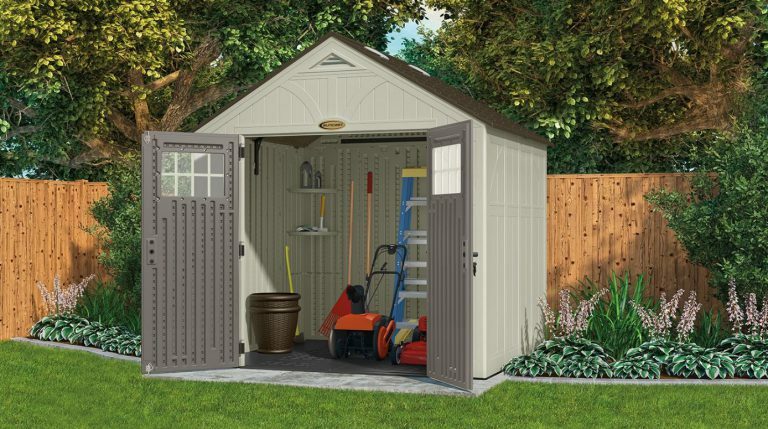 Notably, by eliminating gaps around the perimeter base stops the rain from entering and combats flurries of leaves piling the shed floor plus it blocks pests from invading the premises. 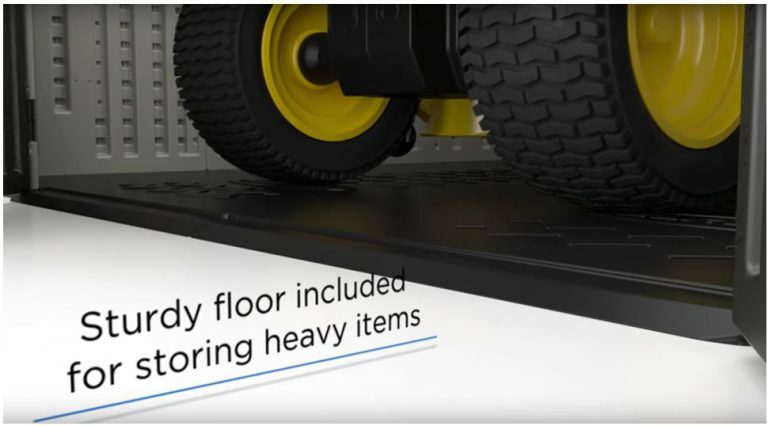 The staunch heavyset resin bed is purposely designed to ride-out the stresses of tractor mowers and storing substantial equipment meanwhile unlike wood, there’s no chance of the floor rotting away due to the chunky polypropylene being unaffected by damp. Importantly however, subsisting continuous storage strains is conditional to stationing on a solid flat substrate. The floor is produced in panel formation; each one interlinks with adjacent panels simultaneous to their borders interlocking with the walls, thus encasing the shed. A sloping threshold at the doors entrance aids wheeling equipment inside. Anchor placements sunk into the floor regard the fixing positions for securing the shed onto solid ground below to safeguard against storms, increasing wind-defence. Step inside and you’re presented with a decent height stretching in excess of 8 feet due to the steep apex structure up above. Overcoming a hemmed-in feeling, it’s lofty & airy due to the 6 skylights & door windows delivering oceans of daylight. Providing more privacy, Tremont’s lack wall-windows however their absence intensifies construction stability. 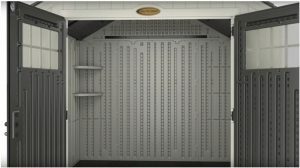 An 8 ft width accompanied by 10 feet in length plus the generous height equates to 574 cubic feet, occupying an abundance of storage room. Two corner shelves are included with a choice of 8 places to install. Unfortunately, additional shelving kits are optional extras however the popular approach to make use of the roomy internals is to incorporate free-standing shelves and large plastic stacking boxes. This solution’s become a firm favourite for many resin shed owners, including ourselves. Another huge benefit with these modern-day resin constructions regards how the integrated ventilation grids combat humidity by distributing fresh air to circulate the interior, abolishing yesteryear’s sweaty atmospheres & saturated walls. Twin doors swing right back to enable easy access for transporting gardening gear. Their robust design combines a double skinned composition of polypropylene, simulating the features of a wooden door, presented in stony shade, providing the same weatherproof and rot-resistant benefits as the walls behold. 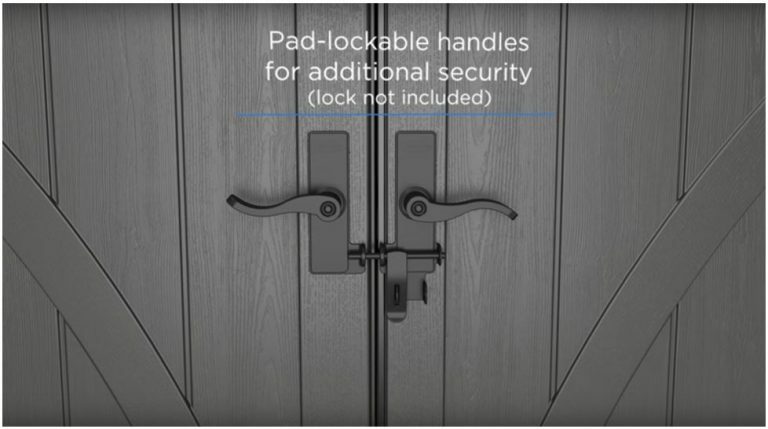 Traditional handles accompanied by a metal through-bolt establishes their closure. A clasp incorporating a hole fits a padlock to secure. 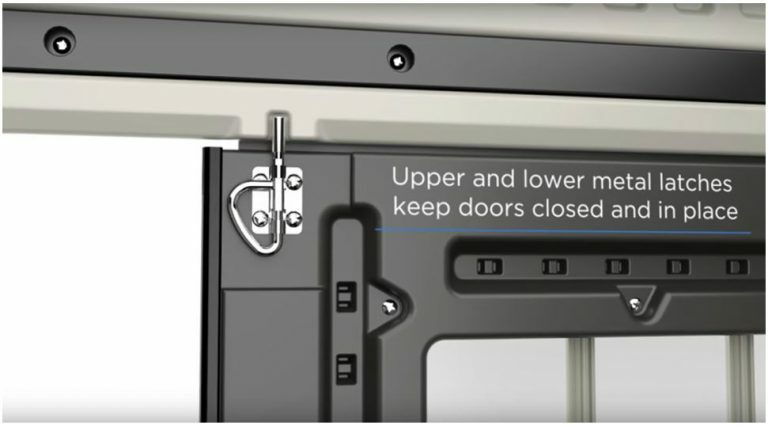 Alongside locking-up, two metal latches incorporated on the internal side of the front facing left door deliver closure & safeguard against freely swinging in windy weather. The latches slide into channels within the top architrave and the floor’s threshold. The doors contain fashionable squared effect windows allowing natural daylight to enter the premises in addition to the 6 skylights in the roof. Close the door behind and a light atmosphere presents. 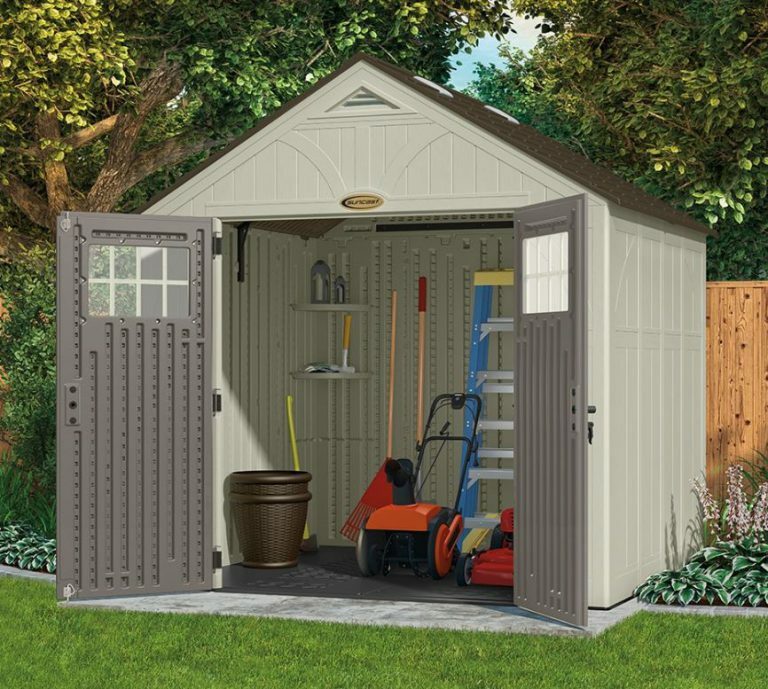 Providing a smooth operation, Suncast doors incorporate three metal hinges per door fulfilling quality access in and out of these sheds. Preparing the correct foundations are the imperative measure to undertake when constructing a plastic shed. Foundations can be wood, concrete, paving or substrates such as tarmac & asphalt however the importance is to ensure the base is solid, level and not stood in a future flood. 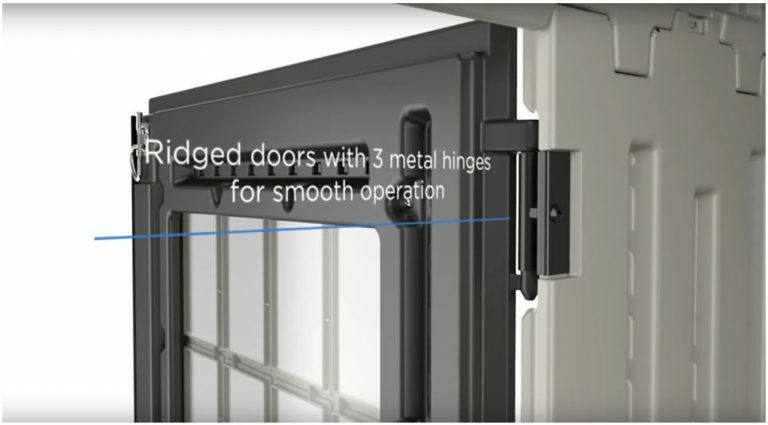 You’ll find the fascia panels line up with ease constructing from level footings which in return aids the vertical alignment of the doors to operate their precise swing further to accomplishing a perpendicular construction. The other essential ingredient concerns stationing on a solid substrate to attain firmly anchoring the base down as well as enhancing the long-tern survival rate of the resin floor. It’s specifically designed hard-wearing and will serve accordingly if these rules are complied with. 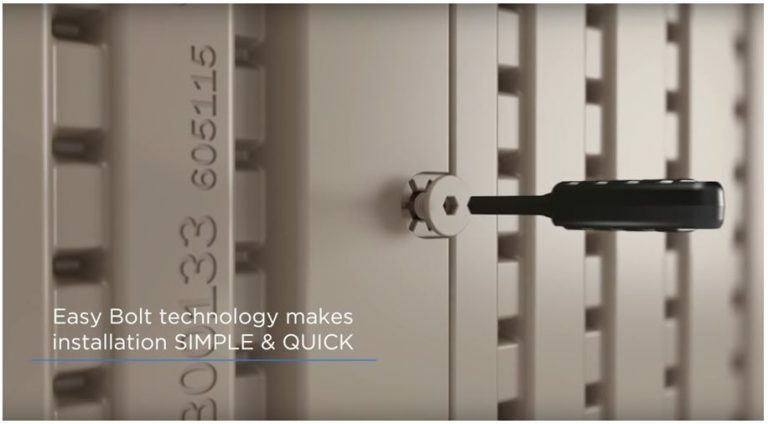 Suncast constructions are built using their provided Easy Bolt Driver for securing the resin screws into the infrastructure when constructing the fascia & roof panels. Plastic shed competition is continuously increasing these days, on account of new innovative low-maintenance designs rolling out onto the market. Tremont’s mid-range facility is a popular choice in the USA, mainly due to Suncast’s establishment however traction is gaining ground over in the UK. They’re a favoured choice with regards to the popular 8 x 10 footprint plus they provide generous headroom height, designed to serve an abundance of outdoor storage solutions. The attractive wood grained semblance certainly tempts many purchasers plus it’s stamped the ground with impressive feedback. 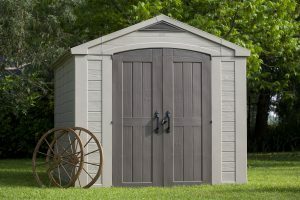 Weather-resistant & durable without the upkeep hassles associated with wooden sheds represent the main draw whilst the quickie wash when dirty favours most of us in this time consuming world. Reason they’re becoming so popular. Thanks for inspecting Suncast’s popular 10 footer. Any queries? Please ask away in the box below. I’ll try and find the answers. Please share Tremont’s 10 footer. Thank you. 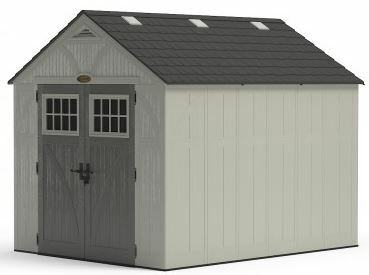 I actually had one of these sheds in my backyard. My husband and I were able to assemble it ourselves. It definitely served it’s purpose. It held up through all kinds of weather. The only thing that put a ding in it was softball size hail that we were able to patch! I would recommend one to anyone who need extra storage space. Hi Angela, thanks for stopping by & messaging about your experience with a Suncast Tremont. Their polypropylene make-up’s intentionally designed to endure changeable weathers from snowfall to rainfall showers and sun-scorch to continuous damp meantime continue on in an unaltered state, the beauty of UV protected resin. They are designed straightforward to assemble, their significant requirement as you’ll understand is making sure they’re constructed from solid level ground. 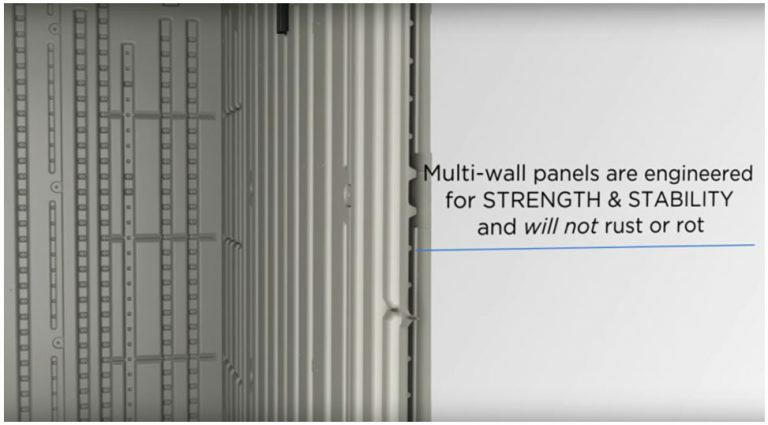 Conforming to these stipulations ensures a correctly stationed & grounded shed which assists installation considerably with regards to efficiently aligning panels. I’m not sure whether a panel cracked by hail would be covered on Tremont’s 10 years warranty, maybe worth verifying with the seller prior to purchase if you commonly suffer substantial sized hail-fall showers. I’m from the UK, where we get plenty of rain along with generally mild conditions throughout the year apart from the occasional humid, torrential rain or freezing days, the reason resin constructions are becoming a popular outdoor storage solution over here. I live on the eastern coast of the United States in Delaware, where we frequently experience coastal flooding. Outside of proper elevation of the Tremont shed above flood water, do you have any concerns with the effect of salt water on the shed? I wasn’t sure how the steel frame and other metal parts, such as the door hinges, faired in a salty environment. We are a few hundred feet from a brackish bay. Hi Mike, thanks for inspecting Tremont storage sheds. I had an Uncle who lived on the coast and the salty air used to corrode the metal of his cars so much quicker than where we live, inland, therefore I understand your concerns. Suncast describe Tremont’s manufacture to “eliminate any risk of rust an rot over the lifetime of the product.” I am informed that the metal framework such as the steel trusses etc are coated in an anti-corrosive finish. I’m guessing they are powder coated in something like polyester, therefore, corrosion will only become an issue if they are scratched through to the steel. A dab of metal primer on the scratches will stop this rust expanding. However, I would verify this with the seller prior to purchase. Another concern I would have is that you don’t want any shed stood in flood water, they must be raised above a floodplain. The make-up is impermeable and they are designed weatherproof for rainwater to drain off falling down upon them however if you immerse them in water they will leak due to faint gaps in the way their fascia panels interlock with the floor, however, I would imagine this dilemma will happen to any shed, wood, metal or resin. I enjoyed your website. It gave me a good look at comparing the different quality plastic sheds. 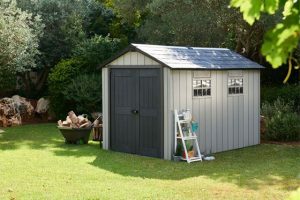 I have not made a decision to purchase a shed, but it is nice to know that someone took the time to compare a bunch of different ones. I thought that it was good that you pointed out the benefits of having a plastic shed. Some of them I hadn’t thought of before. Best wishes! Thanks for visiting and having a stroll around. We’ve gathered a huge range of low maintenance sheds for visitors to inspect to aid their decision prior to purchase. From the most competitive to the fairly extravagant, the smallest of styles to the huge walk-in varieties. 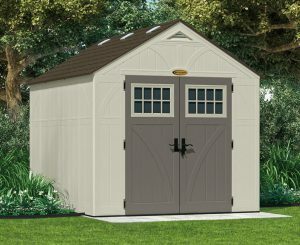 This Tremont 8 x 10 ft shed lies mid-way. The benefits really are their ease of maintenance compared with the cheaper wooden varieties. They side-step conservation issues regarding re-coats of varnish & paint, re-roofing projects and problems associated with rot & decay. All what’s required on the whole is a wash down to maintain their gleam, many use a light pressure-wash, we use a hose-pipe fitted with a shower nozzle & simply spray the facade down. This type of make-up epitomises the ease of modern-day outdoor living rather than being constrained to maintenance year on year. 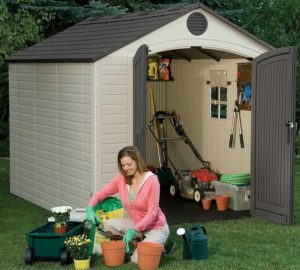 A few months ago I had a plastic shed similar to this one, and it was trash! The roof cracked under just a foot of snow and leaked when the snow began to melt. Later, we tried storing a firewood pile in it but the walls bowed and bent under the weight of the wood. This shed would be a much better choice than that flimsy thing! But, I have to ask, how much snow can the tremont hold up against? We have gotten quite a bit (a little more than two feet) in the past. Thanks! Yeah, this is the problem with the varying qualities on offer within the plastic, wood and metal range of sheds on the market. The snow-load weight this Tremont shed can hold is 20 pounds per square foot, a tad short of the Keter Oakland’s roof strength which is 100kg per sq. metre, described as ultra strong whereas the wind resistance regarding this Tremont is 73 miles per hour. Hope this provides the answers to your query. Here at Quality Plastic Sheds, we only concentrate on low maintenance sheds with sturdy structures which entails a double skinned wall and roof reinforced around a steel infrastructure and truss system adding stability to their overall strength. 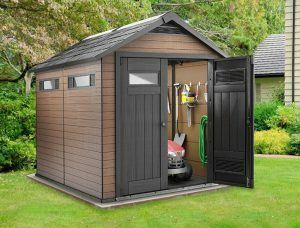 Similar to wooden sheds where the choice is the cheaper option of high maintenance flimsy wooden panels as opposed to a low maintenance pressure treated cedar shed, the price difference is huge, flimsy wooden sheds are cheap whereas cedar sheds are mightily expensive hence the move onto the market with the metal and plastic variety of ranges to counteract price problems. 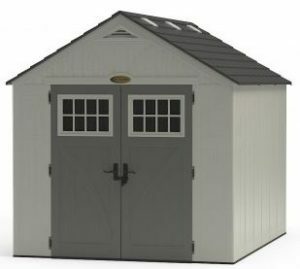 I must admit it staggers me how some of the cheap flimsy plastic sheds hold up to the weather elements, so many are ultra lightweight without sufficient roof supports which will only lead to future problems like you’ve encountered coping with adverse weather.